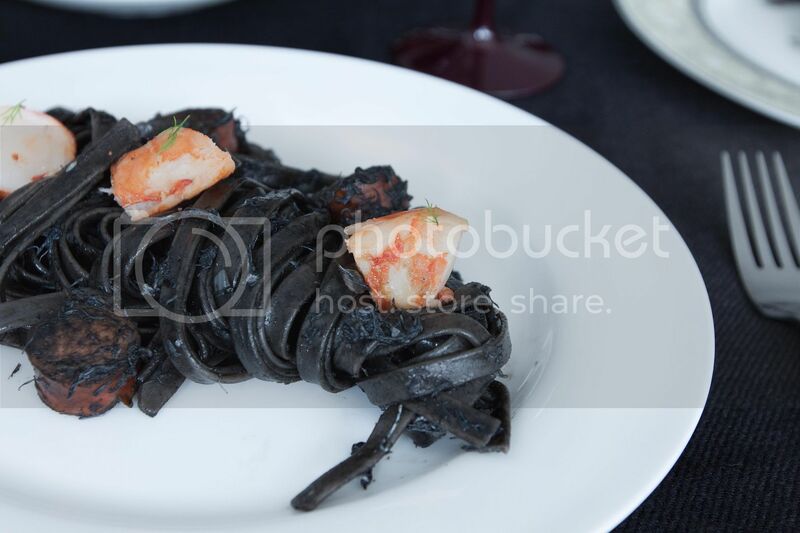 Looking back my old posts for squid ink pasta made me cringe. Despite the potential eyesore, I refused to delete these posts from 2010 and 2011. They are part of me, part of my memories, and without these semi-satisfactory dishes, there's no version 2.0 as of today. Perhaps version 3.0 will come a few more years down the road. Peel and finely chop the shallots. Peel and finely chop the garlic cloves. Cut the sausages into bite size pieces. Take a scissor and cut open the shell for the prawns or shrimps, kind of like butterflying them but just for the center of the shell. Devein, pat dry, and set aside for later use. Bring a big pot of water to a boil and add in few pinches of salt. Add the pasta to salted water and cook till al dente. Once ready, drain well and set aside for later use. If you time it well, the sauce should be ready when the pasta is about done. Use a big pan or a big pot and drizzle 1 to 2 tablespoons of olive oil. Turn to medium high heat and wait till the oil gets hot. Carefully transfer the prawns over and sear till both sides turn red and almost fully cooked through. Remove from the pot and let the prawns rest till cool enough to handle by hand. The residual heat will complete cooking the crustacean. Once cools down, remove the heads and peel away the shells. Cut into large bite size pieces and set aside for now. Use the same pot and drizzle in a little more olive oil to evenly coat the bottom. If there are brown flavorful bits sticking onto the pot, pour just a little bit of wine to deglaze it. Still using medium high heat, add in chopped shallots and garlic along with salt and pepper. Give it a quick stir and cook till the shallots turn translucent but not burning the garlic. Add in the sausages and continue to cook for 30 seconds or so. 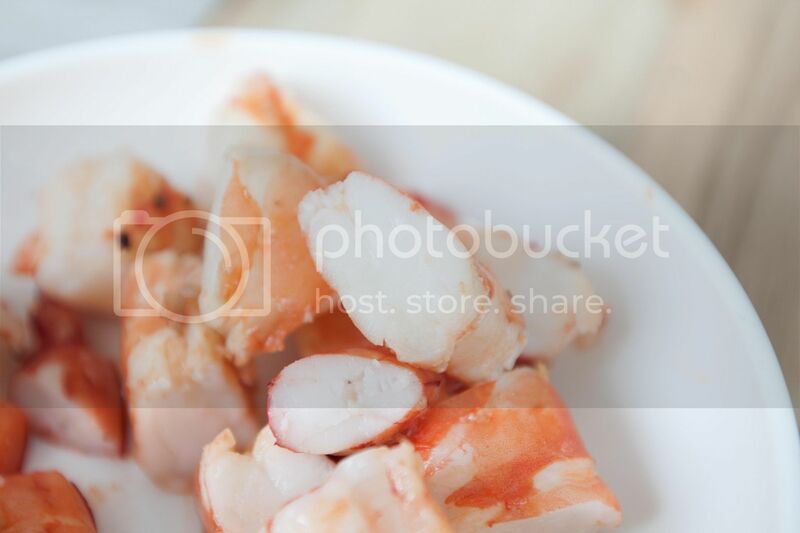 Add in the crab meat and cook for another 30 seconds or so. 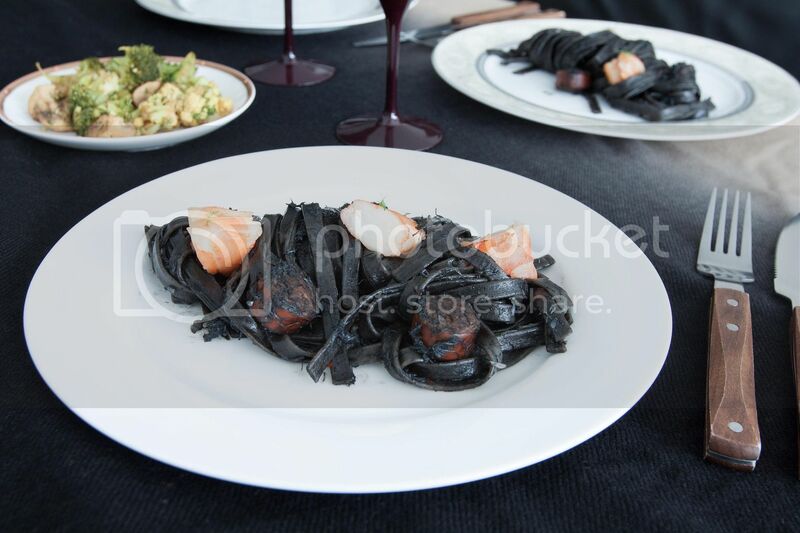 Pour in the remaining wine along with squid ink. Adjust the flavor with additional salt if needed, keep in mind that the flavor will dilute when the pasta is added to the mixture. Bring to a boil then lower the heat to keep it at a simmer for another minute. Pour in cooked pasta and mix well. Squeeze in juice of half lemon. 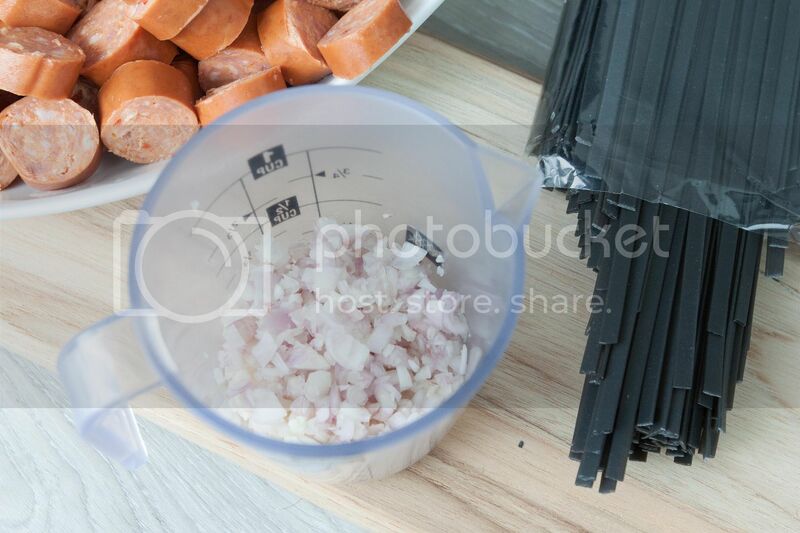 Plate the pasta along with sausages and crab meat. Add a few pieces of prawn and garnish with fresh dill. It's hard to tell if there are any crab meat since they all get darkened by the squid ink, but I kind of like it that way. I only want the color of the prawns to pop out, that's why I avoid mixing them with all other ingredients during the process.